Stags Superfan Arthur Chadburn passed away in November 2006. Arthur was a lifelong Stags fan who traveled away for many years both with SSA and Chris Taylor who ran the Stags away coaches for many, many years. 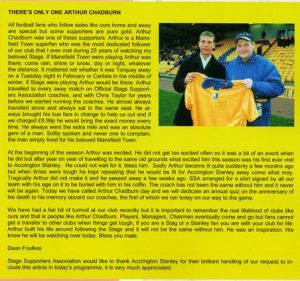 The article on the right was published in the Accrington Stanley match programme shortly after Arthurs death, we would like to express our thanks to Stanley for granting us the space in their match programme for printing this tribute. In memory of Arthur, we have dedicated an annual quiz trophy, an event which takes place on the SSA away coaches. Arthur was very much looking forward to going to Accrington for the Stags first game there in over 40 years, but sadly he passed away just a few weeks before the game. Following a minutes applause on board the coach, the first Quiz was held. 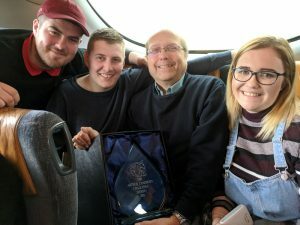 Incredibly, the team that won the quiz were sat in Arthurs favourite seat on the coach and it was fitting that the winners decided the trophy (pictured below) should beput on permanent display in a glass cabinet in his local pub.